I have only five and a half inches more to go before I get to divide for the placket! I am Thermal, hear me roar! I’m saving my perseverance for the sleeves. The body is worth sticking it out because of arm holes, plackets and neck shaping. Sleeves, they got nothing. To counteract the 3mm-ness of Thermal, I cast on for yet another beret. I always feel like I should be wearing a blue-and-white striped shirt when I pick it up. I have some news. Lynn Ross, with whom I took the Aran Knitting class last November, is returning Yarn in Galway on March 10th. She will be running a lace workshop from 11-4pm and you can find out more details here. I would love to go but I am just too busy at the moment Maybe another time. I’ve been digging out lots of new knitting podcasts – just type “Knitting” into the search box at Podcast Alley to see just how many are out there. I have been downloading lots and when I get a chance to listen to some of them, I will put the details up on the Knitting Podcasts page. PS: The toilet seat has disappeared. Did they come back for it? Or did an opportunist run off with it? How does one ‘run off’ with a toilet seat? They’re pretty heavy (not that I picked it up or wondered about bringing it home or anything). Today was a bit strange. It all started this morning when a pigeon landed on my head… as I was walking down the road to the bus stop. I was hurrying to make it to the pedestrian crossing before the green man turned red when I felt a whoosh and something grabbing my hair. I gathered from the flapping feathers around my head that it was a pigeon (a wood pigeon, not yucky street pigeons) – he took off almost straight away. Shouldn’t a fully grown pigeon be able to tell that a moving human is not the best perch? I had a non-stop two hours in college, the result of which is that I really don’t know what I will be doing for the next twelve months. I have a good idea about what I want to do this time next year, but until then there may be a lot more pigeons. On the way home on the bus, a really really smelly old man stood beside me. He chose to move in my direction just as I was yawning. I took in a big lungful of his pong without suspecting and couldn’t help coughing. He started shouting and swearing at me, proper swearing, and moved off to hide among some other people, who all started coughing discreetly. On the walk home, I passed a perfectly good toilet seat propped up against the wall along the road. Did someone stop to rearrange their boot and forget to repack their toilet seat? Was someone carrying it home and just decided it wasn’t worth it halfway? Is there some poor soul out there right now sitting on a bare toilet? Lastly, I want to say hello! to the person in Anchorage who regularly visits the site. Hello! Thank you for visiting! And now for the knitting. Remember how I said I was going to knit another beret? Well, this is the wool for it – more Twilley’s Freedom Spirit. I bought it as a little treat for myself before my mid-year exam. 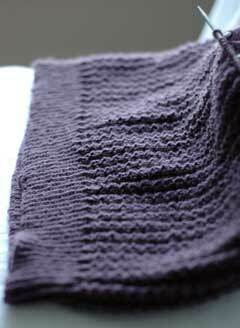 I have been knitting almost exclusively on Thermal these days – apart from yesterday’s swatch, which didn’t take very long. It is growing nicely but I fear I will soon enter the black hole that lies between the waist and the armholes. Kristen is boggled by the amount of teeny-tiny stitches. 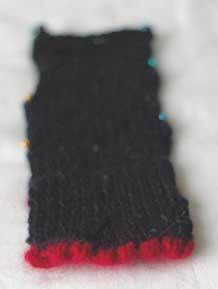 Right now I’m thinking of it as a giant sock – with 3mm needles I’m actually not far off! 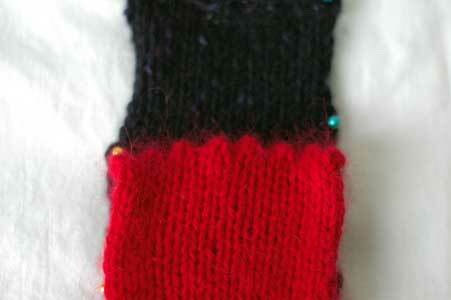 I can’t wait for the sleeves…..
Today I decided to get down to the business of swatching for a potential pattern. I think the idea for this came from petting various shades of angora. Whilst describing a vague idea to my mother on a napkin in the M&S café about two weeks ago, I came up with a shape that might work very well. This would be the hem detail for the bottom of the body and the sleeves. 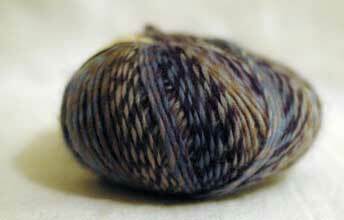 In my swatch, I used angora as the contrasting yarn of the hem. 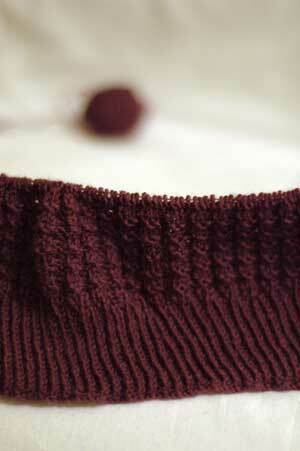 I thought it would be really nice to extend this contrasting hem detail into a turn-up cuff on the sleeves. By turning up the cuffs, you get a three-quarter length sleeve. But you know how there are still plenty of chilly gusts in springtime… I thought it would be really nice to have a cozy cuff to roll back down over your arms, and you still get the pretty hem peeking out. 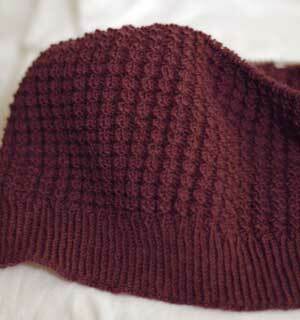 The yarn I used for this swatch is (main colour) Donegal Tweed by Kilcarra Yarns. This is from the neolithic strata of my stash. I got it in Clifden about three years ago when I was on a trip with Alb. It is 100% wool and a bit too scratchy for the real thing but the colour is what I had in mind. The pink angora is Adriafil ‘Carezza’ and is 70% angora, 10% wool and 20% polyamid. I love the softness of the angora but I don’t really like the colour. You get the idea though. I think this top would work well with other colour combinations – navy cotton and blue angora or green cotton and cream angora. Or go mad with burnt orange and bright red! I’m undecided about neckline. I’ve got four options, and I think all would work – it’s more a matter of personal taste. Maybe I could knit the sample with the one I like best, and just write up the other three options to include with the pattern. Thermal is inching its way along. Can I just say again how much I love the scrunchiness of the fabric?! Jaeger’s the way to go, man. I had a very enjoyable read of my new Fitted Knits in bed last night and came away with two definite conclusions. One is that I really need to learn about sewing construction. I need to take a class or something. I know alot from reading tonnes about knitting technique and knitting up and adjusting patterns myself, but shaping taken from sewing is prevalent throughout Japel’s book and it works very well. It would be really good to know. The other conclusion is that I think I’m going in the right direction. My piano teacher always tells me to trust my instinct because it will never let me down – and it never has, not with piano anyway. So I’m going to keep going, see what I come up with, and if other people like it, then all the better! If anyone has any suggestions for change or improvement here (re: the swatch etc), I’m all eyes and ears. My commuting blue sock had the pleasure of sharing my handbag with cheese, eggs and a big bunch of scallions this morning because I forgot to bring my shopping bag. I thought I had one with me. I got really paranoid in Lidl and became convinced someone had stolen it out of my handbag (who says I need to stop drinking coffee?). But the sock is none the worse for wear and actually smells a bit better than before. Whilst in town, I finally picked up my Fitted Knits and found a copy of Crochet Today in Easons. Interesting! Crochet Today is like a crochet version of KnitScene. If you go to the CT site, you’ll see all the projects that are in this issue. Fitted Knits is and isn’t what I expected! I expected it to be full of very unique, Japel-ish designs, and it is. However I actually can’t see myself ever knitting something from the book! I feel very confused. These are my two favourites from the book. Despite the no-knit thing, there are many things I love about the book. Firstly, there is the great photography. There are many detailed shots of each project. Then there’s the schematics. They are so detailed that if you chose to knit a project from the book, only a little bit of attention to your own measurements would be needed to knit something perfectly suited to your shape. There is a great selection of garment types too. I think this will be one of my ‘inspiration’ books. …well, nearly. Today was cool because I got some work started on pieces I haven’t played in a while, and I had the day to myself to put my feet up for a good spell and get some knitting done too. Thermal is back to where it was! (I arted up the shot because it’s basically the same picture from before I frogged it… I knew you could tell). I had a paranoia attack right after I took this picture and started obsessively-compulsively measuring. It’s doing a bit better. Ten extra stitches doesn’t sound like much, but it’s five more little waffle squares, and when you think of it like that it makes you waffley hungry it seems like more. 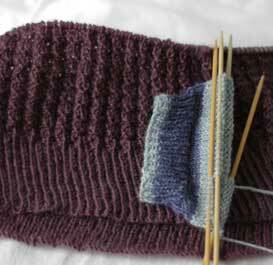 There’s nothing like a good episode of A Touch of Frost to get a good re-start on a sweater. 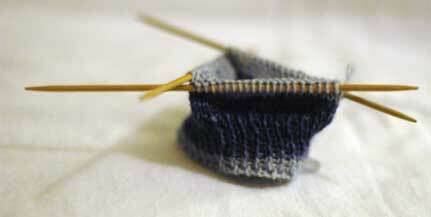 Remember my prediction for a completed pair of blue socks by today? It was looking so sorry for itself tonight, it was practically crying into the sofa cushions. Oh well, there’ll be plenty of commuter knitting for it next week, because Thermal will probably be too cumbersome to chuck in my handbag after the weekend. I received the Spring issue of Interweave Knits last Tuesday. I enjoy reading the articles and I admire some of the patterns, but there’s nothing in it to add to my wish-list (thank God! my wish-list has turned into one of those never-ending scrolls). I also picked up this month’s issue of Knit Today when I was in town… an enjoyable read over a cuppa but nothing very inspiring. 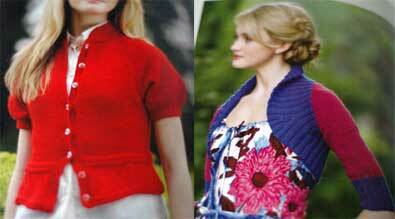 Speaking of inspiration – I got a call from Chapters to say that Fitted Knits has finally come in. Apparently their supplier in the US is in Pennsylvania and they have had crazy snow during the week, which slowed up a lot of their deliveries. In a way, I don’t mind, because I’ve had the IK to keep me going and I am so looking forward to this book! I had some other news but I can’t remember now… oh yes! A new episode of Craftypod is up and with it, a link to a great new service – Swap-Bot. Swap-Bot is a free service that allows you to participate in all sorts of swaps. It is mostly craft-orientated but you can swap books too. Check it out! I have signed up for Crash Your Stash! I pick out two unwanted skeins of yarn from my stash and post them off to a better home, and I will receive two more skeins into the bosom of my yarn. I have about a million left-over balls from projects and I know I won’t use it – even I have a limit on the amount of hats I want to make (but did I tell you? I’m planning on a new beret :D). And keep an eye on This is Knit… they’ve got fantastic books coming in and have you seen the preview of the new Lorna’s Laces colours here? Waiter, one large bib please!